Sinningia leucotricha has unquestionably the best foliage of any sinningia. 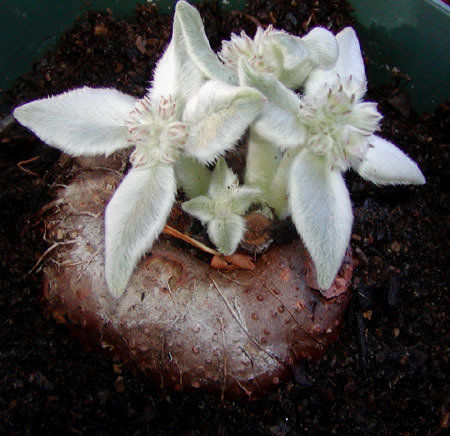 The silvery hairs cover the young leaves. The tuber is a typical "bagel", with a raised rim and a knob at the center from which the shoots emerge. This young plant has a tuber 2 cm in diameter. 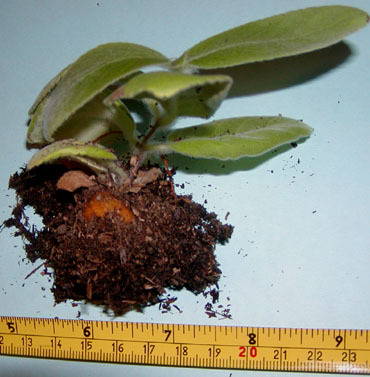 Note the juvenile foliage, with four pairs of leaves and indeterminate growth. A mature plant will usually have just two leaf pairs per stem, determinate growth, and flowers emerging from the shoot apex.